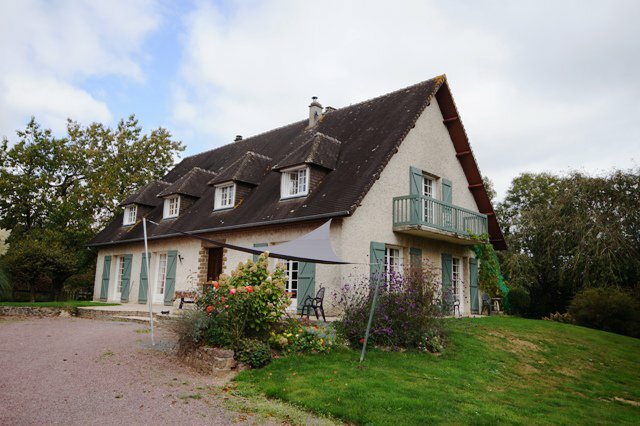 Tucked away in a small hamlet yet only 15 minutes from Coutances this property has much to offer, it has generous living space and over 6 acres of land for horses and other animals. It could also offer an ideal business opportunity as there are cat pens and dog kennels. A large fitted kitchen with space for dining and a wood burner for those chilly winter mornings. A door leads to the rear garden. A bedroom with doors to the garden is next to a newly fitted shower room and separate wc. Finally there is a study which could also be used as bedroom 5.
master bedroom has doors opening onto a small balcony, there are two further large bedrooms and a family bathroom with wc. Extra storage if needed can found in the eaves as there is lighting and plenty of space here to walk in. On the lower ground floor the basement is the length of the house and has been divided into sections, there is a wine cellar, rooms for storage and the cattery area. Outside the land is mostly to the rear of the property with an orchard on one side and veg plot on the other. A secure area for the four professional dog kennels which have inside and outside space and an exercise area. There are 3 separate paddocks all enclosed by either natural hedges or fencing, a stable for 2 horses, large hangar, well water, bbq area and plenty of space for parking. House (170 m²) on basement comprising on the ground floor: entrance, living room, kitchen, bathroom , WC, bedroom and office. On the floor: three rooms, room of bath. Outbuildings, shed, shed, barn, chicken coop, kennels. Field of approval.